today I want to introduce mouse readers to an important project restore cleveland hope (RCH) and my friend joan southgate, the founder of RCH. perhaps once you learn about joan and RCH, you will want to support the current campaign toward the restoration of the historic cozad-bates house and the development of an underground railroad educational center. the cozad-bates house, a spectacular example of italianate architecture, is the only pre-civil war structure still standing in cleveland’s university circle neighborhood. in 2006 the house was saved from the wrecking ball when university hospitals graciously donated the house to university circle inc (UCI). today, RCH joins with UCI, and the cleveland restoration society to restore this once magnificent house from the ravages of abandonment and neglect and transform the house into an educational center. when the house was built, cleveland was an important center for abolitionist and underground railroad activity. the cozads, and their neighbors, the fords, were prominent members of cleveland’s anti-slavery movement. each station along the underground railroad was known by a code name; cleveland was called ‘hope.’ when the freedom seekers reached hope they were close to the end of their journey to freedom. you may have already heard of joan southgate. in 2002, joan walked from cincinnati to cleveland along the path of the underground railroad. she embarked on the journey to honor and celebrate the courageous individuals who walked that route in the past. as she walked she educated people by talking with all who came out to meet with her. in 2003 Joan continued her journey and walked from cleveland to ct. catherine’s ontario. joan wrote a book documenting the journey: In Their Path: A Grandmother’s 519-Mile Underground Railroad Walk. upon completion of her 2003 walk joan learned that the cozad-bates house, the last link to cleveland abolitionist past, faced a serious risk of demolition. joan felt it was vital to save such sacred ground. she immediately began organizing and in 2006 through the efforts of her grass-roots organization, RCH, the house was spared. the journey is not over; the next step is to restore the house – and to create hope for the future by celebrating and remembering the past with the establishment of an educational resource center. this spring, joan, at 80 years young, will embark on another walking journey. 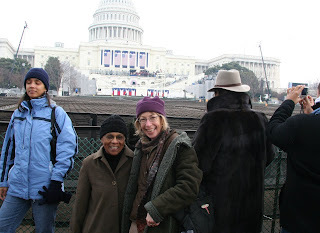 this journey, in their path 2009, joan will again raise awareness about the brave and courageous freedom seekers and she will also be raising funds toward the establishment of an underground railroad educational center. joan will walk from the salem chapel in st. catherine’s to cleveland’s cozad-bates house, a 250-mile journey. joan has set a goal to raise $1,000 for each mile of this journey and has asked her friends to help her meet this goal. as joan’s friend and a believer in this important project, I would like for joan not only to meet her goal but also to exceed it--times are hard for many of us right now and there are many righteous causes and this is a most righteous cause and journey. I hope that introducing you to joan and the restore cleveland hope project some may wish to take part in the journey too and support the campaign and the project. if you do please, visit the restore cleveland hope website there is information on how to donate. you can learn more about the project and joan by visitng here and here. we are all freedom seekers. come along. today I wish to honor harriet tubman, no one is certain when she was born, therefore the day she died, march 10th, is a good day to celebrate her life and accomplishments. in addition to her courageous work on behalf of the abolition of slavery and her work on the underground railroad, tubman was also active in the the cause of women's suffrage. those are pretty wonderful women you're writing about today, kimy. And I loved the vid in Niagara. Wish I could contribute financially - even from a strictly architectural perspective, the Cozad-Bates house in fabulous and deserves TLC. With the history attached to it, it truly is a national monument. I've linked up to Joan, though, and will follow the story with great interest. Muchas gracias. Have a great day. Thanks for letting us know about this remarkable woman; she must have incredible vitality to accomplish these things. All my best to her. If the walls of that house could talk, oh, the stories they would tell. I admire Joan walking the railroad path herself - that would create such a personal perception of the journey others have taken and make it real in a way that just reading about it couldn't. I hope you understand how much your blog is appreciated for bringing all this information to us. Sounds like a good cause and a remarkable woman! I hope the house can be restored to its former glory and the story of the underground railway will live on for future generations! Thanks for sharing this information, sounds like such a great project. I love preservation and restoration of historical architecture. And I raise my tea cup to Ms. Tubman. She was a brave and remarkable woman! my word verification is "sally"...how did it know willow was here? Thanks for all this information. I remember you talking about Joan Southgate before, and of course any day is a good day to honor Harriet Tubman. 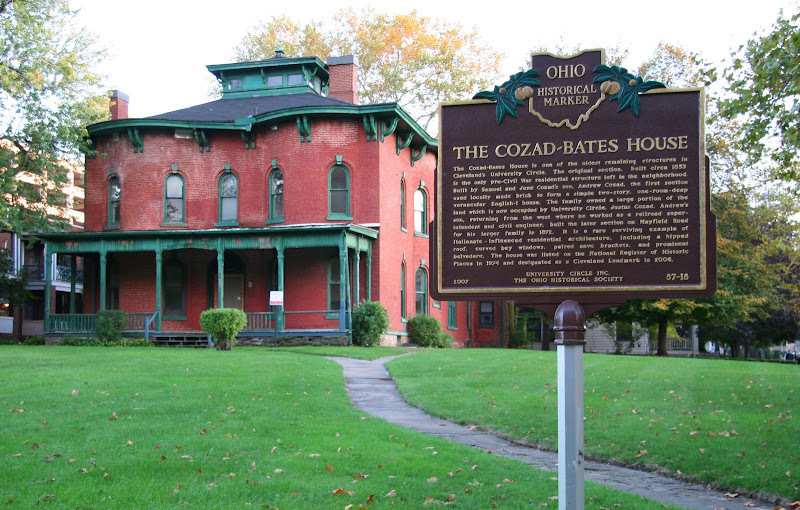 Mostly what grabbed me was the photo of the Cozad-Bates house, though. A gorgeous piece of architecture, and my heart hurt to see the condition it was in. I live in a city dedicated to preserving the architecture of its past - several organizations dedicated to preserving and restoring colonial houses (The Newport Restoration Foundation, Operation Clapboard, and more); The Preservation Society of Newport County, which successfully saved the old 19th Century Bellevue Ave. mansions from the wrecking ball, restored them to their original glory, and turned them into museums for all to enjoy; and the countless individual property owners who purchased decaying 18th, 19th, and early 20th Century homes and spent much time and money lovingly restoring these old homes to their original condition. There are areas in Newport where you can forget that you're in the 21st Century. So the effort to restore the Cozad-Bates house gets a loud huzzah from me (sorry, no cash; unemployment kinda makes that difficult). What a wonderful project and important piece of history to be preserved and restored. Joan is a strong woman. I wish they had restored some of the Underground railroad homes here in Nyack. We have several markers at sites where the buildings once stood. It is a wonderful thing she does to save this place. And walking so far, that is why she is so young. Thank you for the post. OOOhhh, scarey, that was the 13th comment, is that a sign? Yes, I am now afraid. Did not plan that. I enjoyed reading all the wonderful comments. thanks for everyone's support - even if not you are unable to send a check to the restore cleveland hope project; you are sending best wishes and thoughts for success -- good energy directed toward a goal helps! I like this post keep it up. beautiful tribute to one of our nation's most remarkable matriarchs! Found my way here by way of Empty Nest Evolution. LOVE the post. Just printed out my pledge card! Right up my alley. Thank you.